How to choose a product to gain access to an intranet? How to choose an Internet-facing product? How to save the Internet cost? How to use cloud products in a VPC? Virtual Private Cloud (VPC) is a private network established in Alibaba Cloud. VPCs are logically isolated from other virtual networks in Alibaba Cloud. VPC is a private network dedicated to you in Alibaba Cloud. You have full control over your VPC, such as specifying its IP address range, and configuring route tables and network gateways. You can also use Alibaba Cloud resources such as ECS, RDS, and SLB in your own VPC. Additionally, you can connect VPCs with a local network using a dedicated connection or VPN Gateway to form an on-demand customizable network environment. This allows you to smoothly migrate applications to the cloud with little effort. Each VPC consists of a private CIDR block, a VRouter and at least a VSwitch. When creating a VPC or a VSwitch, you must specify the private IP address range in the form of Classless Inter-Domain Routing (CIDR) block. For more information, see Classless Inter-Domain Routing. You can use any of the following standard CIDR blocks and their subnets as the IP address range of the VPC. For more information, see Plan and design VPC. Note To use a subnet of a standard CIDR block, you must use the CreateVpc API to create a VPC. VRouter is the hub of a VPC. As an important component of a VPC, it connects VSwitches in a VPC and serves as the gateway connecting the VPC with other networks. Alibaba Cloud automatically creates VRouter after you create a VPC. A VRouter associates with a route table by default. For more information, see Routing. VSwitch is a basic network module in a VPC to connect different cloud product instances. After creating a VPC, you can further segment your virtual private network to one or more subnets by creating VSwitches. 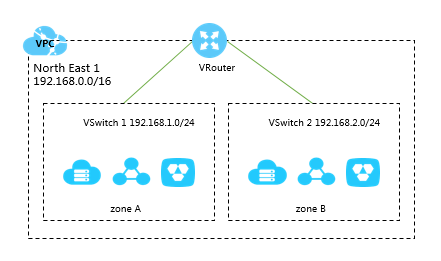 The VSwitches within a VPC are interconnected by default. Therefore, you can deploy different applications to VSwitches that are located in different zones to improve the service availability. For more information, see Manage VSwitches.